The name of an alcohol comes from the hydrocarbon from which it was derived. The final -e in the name of the hydrocarbon is replaced by -ol, and the carbon atom to which the –OH group is bonded is indicated by a number placed before the name. Carbohydrates are large biomolecules made up of carbon, hydrogen, and oxygen. The dietary forms of carbohydrates are foods rich in these types of molecules, like pastas, bread, and candy. The name “carbohydrate” comes from the formula of the molecules, which can be described by the general formula Cm(H2O)n, which shows that they are in a sense “carbon and water” or “hydrates of carbon.” In many cases, m and n have the same value, but they can be different. 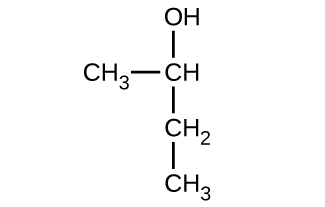 The smaller carbohydrates are generally referred to as “sugars,” the biochemical term for this group of molecules is “saccharide” from the Greek word for sugar (Figure 1). Depending on the number of sugar units joined together, they may be classified as monosaccharides (one sugar unit), disaccharides (two sugar units), oligosaccharides (a few sugars), or polysaccharides (the polymeric version of sugars—polymers were described in the feature box earlier in this chapter on recycling plastics). The scientific names of sugars can be recognized by the suffix -ose at the end of the name (for instance, fruit sugar is a monosaccharide called “fructose” and milk sugar is a disaccharide called lactose composed of two monosaccharides, glucose and galactose, connected together). Sugars contain some of the functional groups we have discussed: Note the alcohol groups present in the structures and how monosaccharide units are linked to form a disaccharide by formation of an ether. Figure 1. 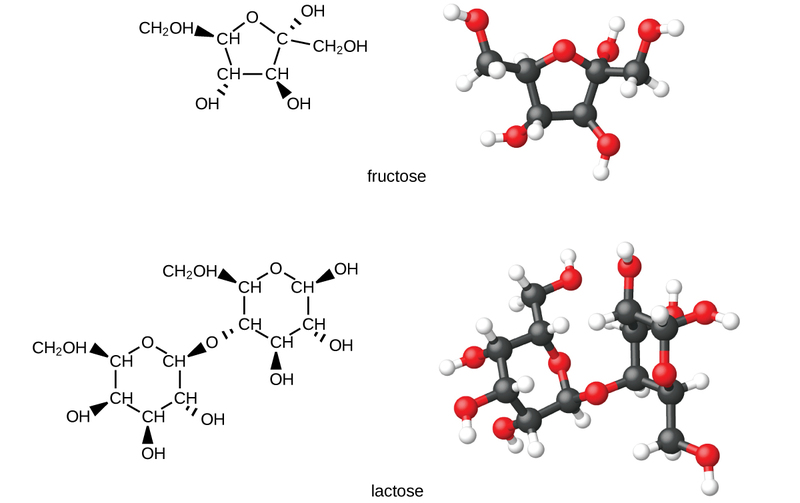 The illustrations show the molecular structures of fructose, a five-carbon monosaccharide, and of lactose, a disaccharide composed of two isomeric, six-carbon sugars. 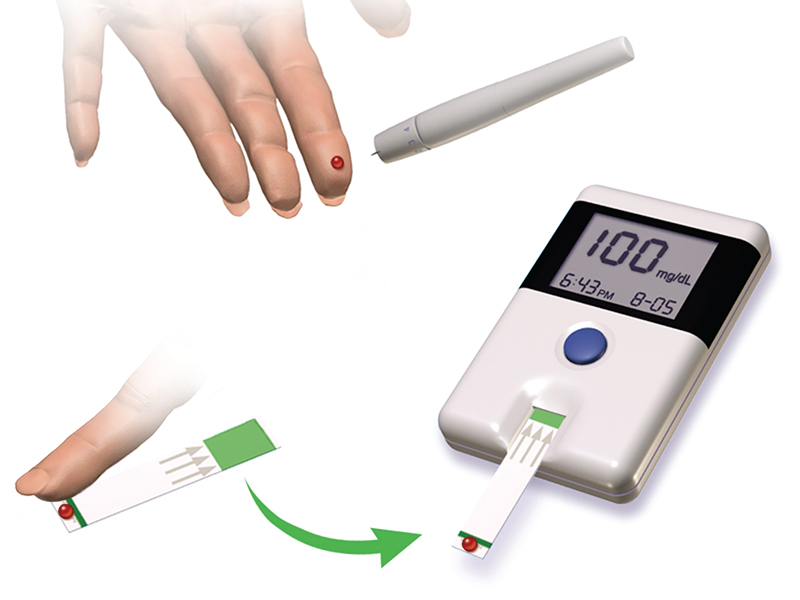 Diabetes is a group of metabolic diseases in which a person has a high sugar concentration in their blood (Figure 2). Diabetes may be caused by insufficient insulin production by the pancreas or by the body’s cells not responding properly to the insulin that is produced. In a healthy person, insulin is produced when it is needed and functions to transport glucose from the blood into the cells where it can be used for energy. The long-term complications of diabetes can include loss of eyesight, heart disease, and kidney failure. 20.2 Alcohols and Ethers by Rice University is licensed under a Creative Commons Attribution 4.0 International License, except where otherwise noted.